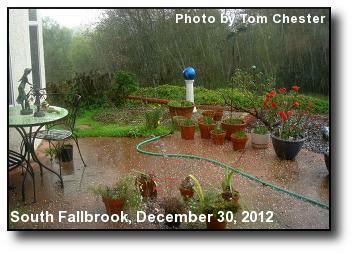 Falling Hail: A thunderstorm hurled hail at this South Fallbrook patio. Photo courtesy of Tom Chester. 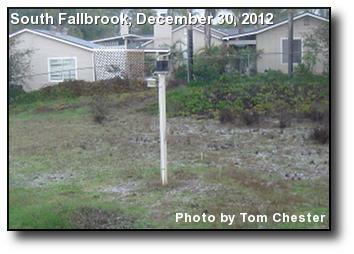 White Stuff: Hail on the ground around WeatherCurrents' Fallbrook station. Photo courtesy of Tom Chester. 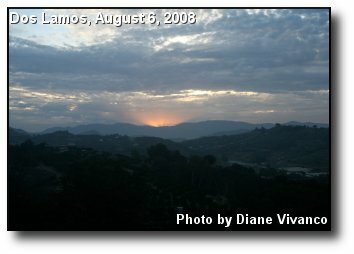 Westerly Sunset: Looking west over the Fallbrook Naval Weapons Station from a deck in Fallbrook. Photo courtesy of Dave Serven. 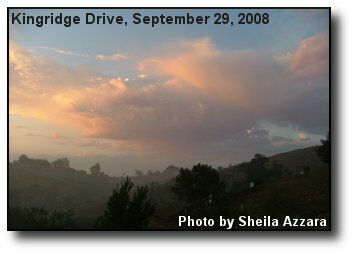 High and Low: A layer of low clouds over Fallbrook below; monsoonal clouds above on a September day. Photo courtesy of Beth Cobb. 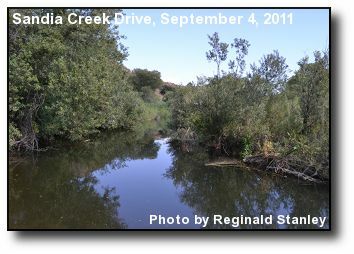 River Run: A tranquil Santa Margarita river, taken from Sandia Creek Road north of Fallbrook. Photo courtesy of Reginald Stanley. 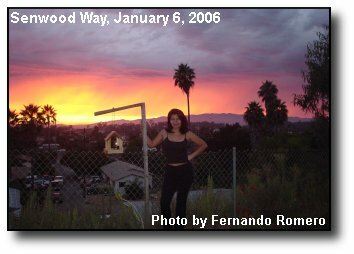 Western Sunset: Orange, red and purple mark the western horizon at sunset. Photo courtesy of Louise Perreault-Greenlee. 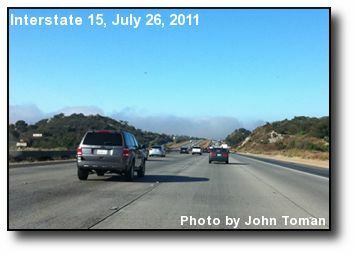 Marine Layer: A bank of morning low clouds sits in the distance near Fallbrook's Mission Road exit. Photo courtesy of John Toman. 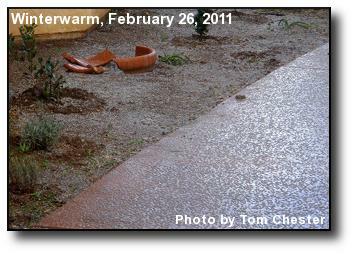 Melting Hail: Hail melts quickly after falling in the Winterwarm area. Photo courtesy of Tom Chester. 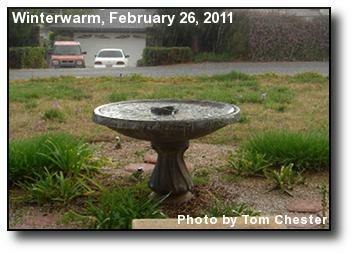 Brief Hail: A five minute hailstorm falls on a fountain in the Winterwarm area. Photo courtesy of Tom Chester. 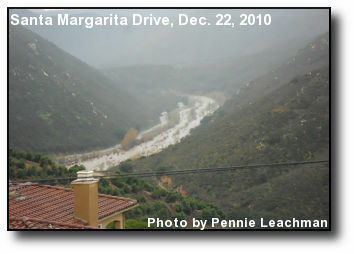 River Runoff: The Santa Margarita River north of Fallbrook, swollen from a week of rain. Photo courtesy of Pennie Leachman. 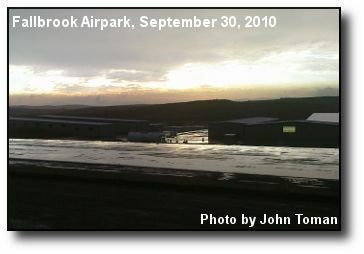 Wet Sunset: Freshly rainfall gleans on the runway at the Fallbrook Airpark, with a break in the clouds off to the west. Photo courtesy of John Toman. 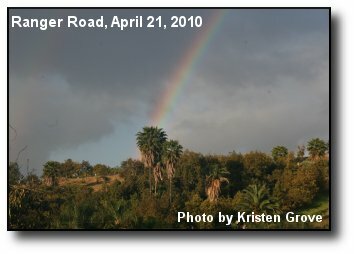 April Rainbow: A rainbow rises over Fallbrook during some April showers. Photo courtesy of Kristen Grove. 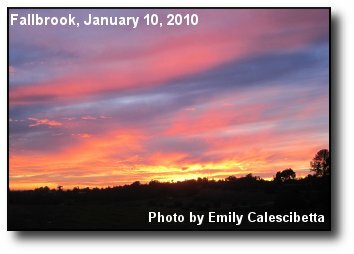 Sunset Color: Across the rolling hills of Fallbrook, the sun says goodbye to a day. Photo courtesy of Emily Caliscibetta. 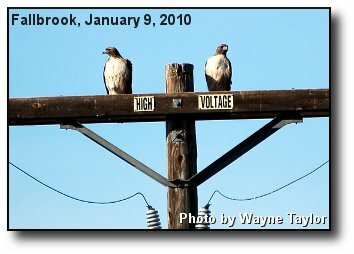 High Voltage: A couple or red-tailed hawks peer from a power pole. Photo courtesy of Wayne Taylor. 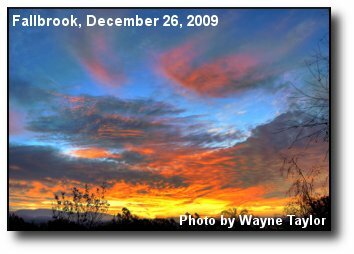 Winter Sunrise: The rising sun fires up some clouds, looking east from Fallbrook. Photo courtesy of Wayne Taylor. 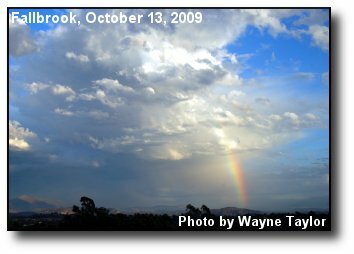 Partial Rainbow: Following a recent storm, a rainbow reaches into a cloud. Photo courtesy of Wayne Taylor. 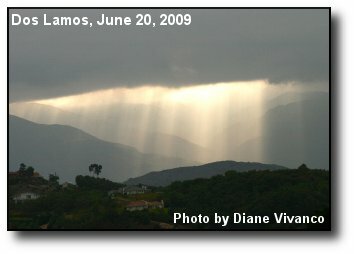 Sun Rays: A break in the clouds allows some sun through, with the Palomar Mountain range in the background. 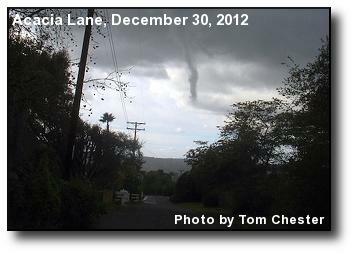 Photo courtesy of Diane Vivanco. 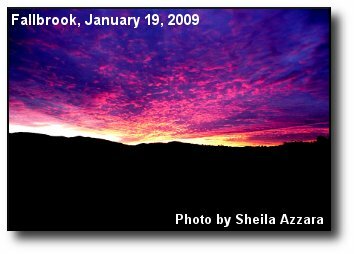 Mountain Sunrise: Red and purple fill the sky above the Palomar Mountain range and the Gird Valley. Photo courtesy of Sheila Azzara. 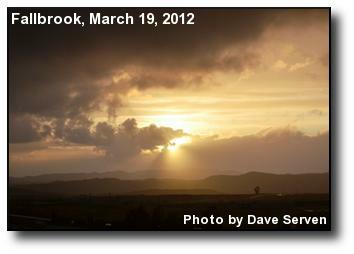 Gray Sunset: A formation of gray clouds at sunset over Fallbrook. Photo courtesy of Ann Perham. 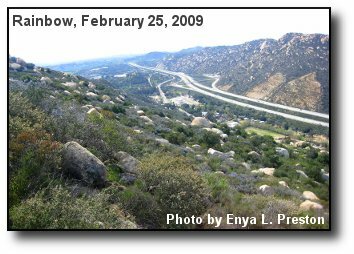 Valley Freeway: Interstate 15 weaves south through the Rainbow Canyon. Photo courtesy of Enya L. Preston. 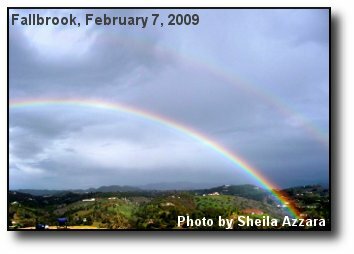 Double Rainbow: Twin rainbows cross the Fallbrook sky on a stormy afternoon. Photo courtesy of Sheila Azzara. 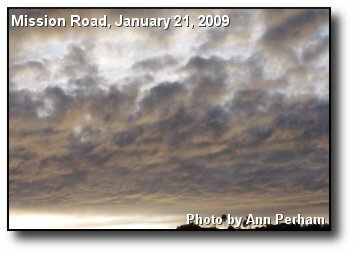 Before the Storm: Clouds at sunset before a November storm. Photo courtesy of Sheila Azzara. 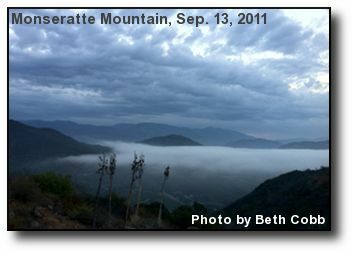 Morning Thunder: Morning clouds gather over Mt. 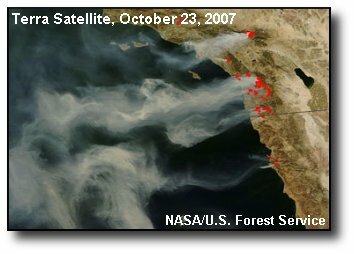 Palomar range, east of Fallbrook. Photo courtesy of Shiela Azzara. 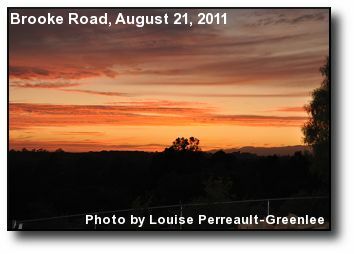 Eastern View: A serene view of sunrise over the Palomar Mountain range. Photo courtesy of Diane Vivanco. 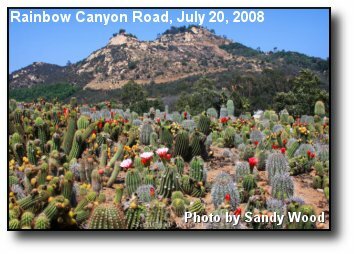 Blooming Cactus: A field of cactus in summer bloom in the Rainbow area. Photo courtesy of Sandy Wood. 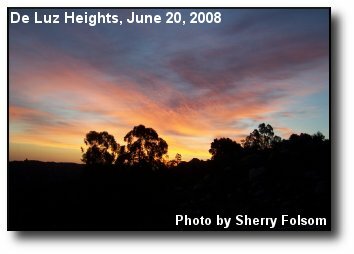 Summer Sunrise: The sun rises ahead of triple digit heat in De Luz Heights. Photo courtesy of Sherry Folsom. 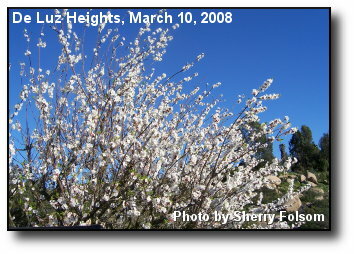 Apricot Blossoms: The product of a wet winter and warm March in De Luz Heights. Photo courtesy of Sherry Folsom. 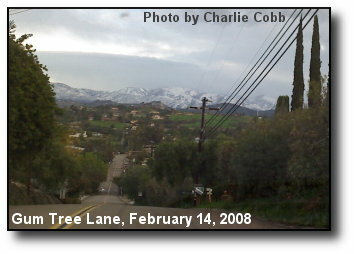 Valentine's Day Snow: A view of the foothills of the Palomar Mountain range from Fallbrook. Photo courtesy of Art Rideout. 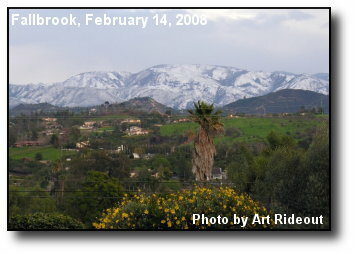 Low Snow: Ephemeral snow in the foothills to the east of Fallbrook. Photo courtesy of Charlie Cobb. 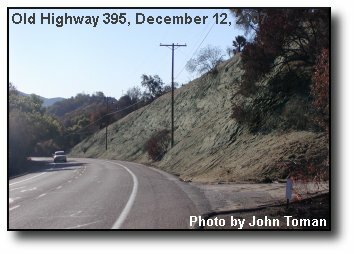 Slope Hope: A greenish hydroseeded slope in the burn zone on Old Highway 395 may minimize winter mudslides. Photo courtesy of John Toman. 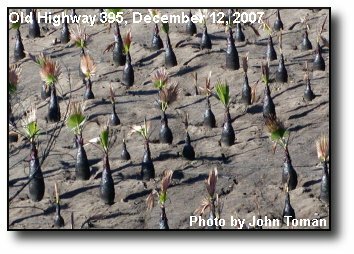 Fire Survivors: Green fronds on a blackened palm tree farm lead a fragile recovery. Photo courtesy of John Toman. 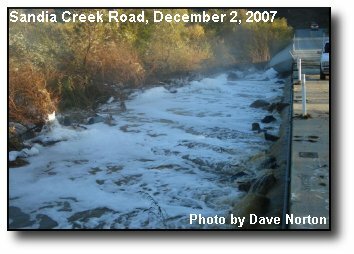 Storm Runoff: Foamy water from a 3-4 inch drenching flows out the Santa Margarita River in De Luz. Photo courtesy of Dave Norton. 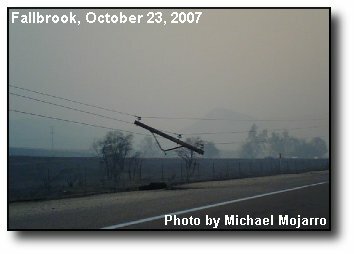 Power Down: The remnants of a power line on a road in Fallbrook. Photo courtesy of Michael Mojarro. 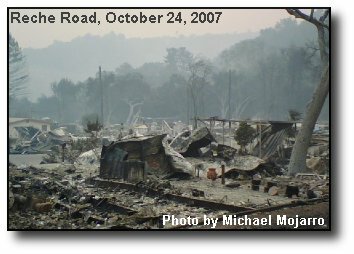 Fire Devastation: A scene from a mobile home park on Reche Road in Fallbrook after the Rice Canyon Fire raced through it. Photo courtesy of Michael Mojarro. 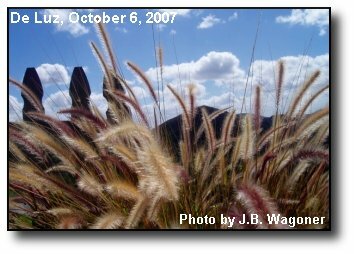 Fall Scene: Colorful fountain grass and a wood fence accent the post-storm sky. Photo courtesy of J.B. Wagoner. 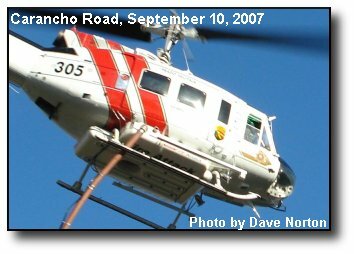 Fire Season: A California Department of Forestry helicopter helps fight the Colina Fire in De Luz. Photo courtesy of Dave Norton. 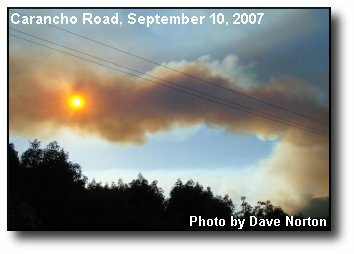 Smoke Plume: A winding column of smoke from the Colina Fire in De Luz blots the sun. Photo courtesy of Dave Norton. 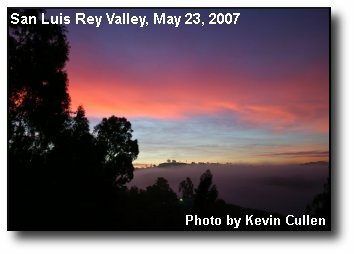 Valley Clouds: A marine layer blanket and some high clouds meet sunrise over the San Luis Rey valley. Photo courtesy of Kevin Cullen. 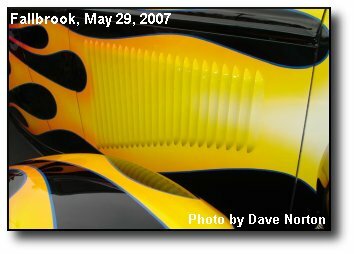 Flames and Louvers: Lots of color and style were seen at the 42nd Fallbrook Vintage Car Show. Photo courtesy of Dave Norton. 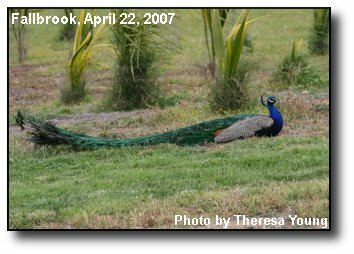 Peacock Plumage: A resting peacock covers some real estate in Fallbrook. Photo courtesy of Theresa Young. 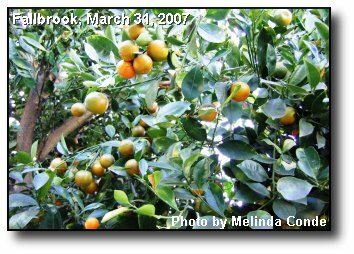 Fillpino Limes: A crop of limes on this kalamansi tree brighten a Fallbrook backyard. Photo courtesy of Melinda Conde. 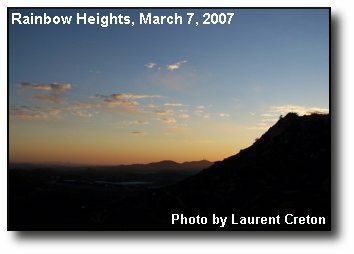 Heights Sunset: An evening from atop Rainbow Heights Road. Photo courtesy of Laurent Creton. 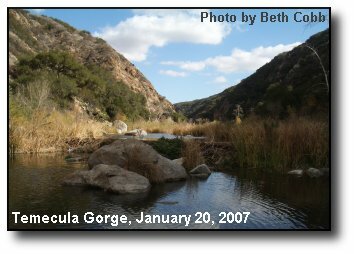 River View: A tranquil winter scene along the Santa Margarita River, in the Temecula Gorge. Photo courtesy of Bett Cobb. 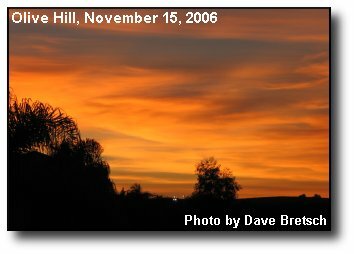 Olive Hill Sunset: November setting sun as seen from over Olive Hill. Photo courtesy of Dave Bretsch. 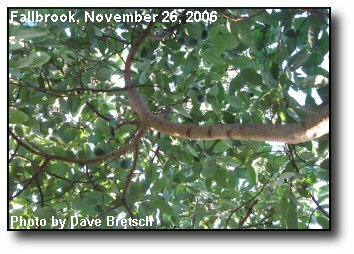 Avocado Canopy: The branches of an avocado tree from below, screening out the sky. Photo courtesy of Dave Bretsch. 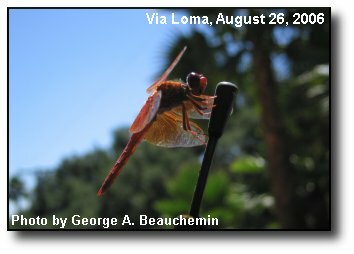 Free Ride: A dragonfly hitches a ride on a Fallbrook car antenna. Photo courtesy of George Beauchemin. 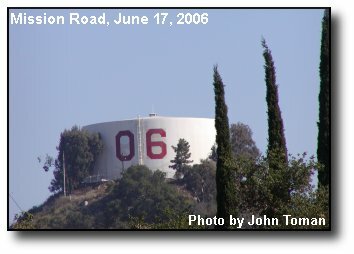 Water Tower: The Mission Road water tower honors the Fallbrook Union High School Class of 2006. Photo courtesy of John Toman. 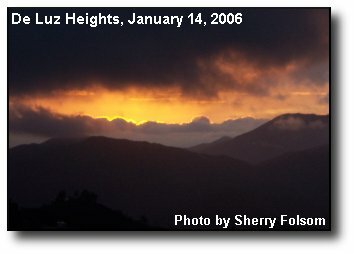 Sunset View: The fading sun across Fallbrook's hills. Gabriela Romero is in the foreground. Photo courtesy of Fernando Romero. 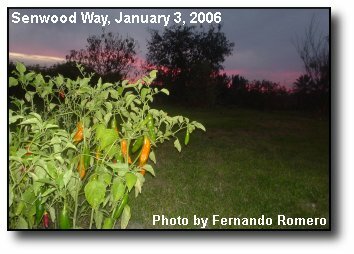 Ají Verde: Also known as Peruvian Chile, growing in a Fallbrook backyard. Photo courtesy of Fernando Romero. 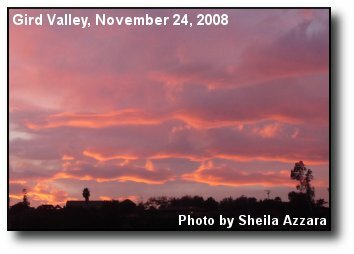 Stormy Sunset: Clouds and hills intermingle with an orange horizon at sunset. Photo courtesy of Sherry Folsom. 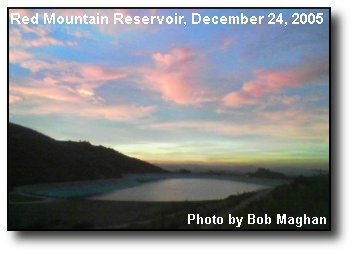 Winter Reflection: The colors of sunrise are reflected in Fallbrook's Red Mountain Reservoir. Photo courtesy of Bob Maghan. 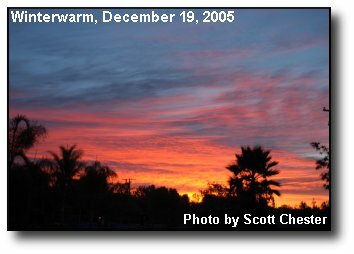 Winterwarm Sunrise: Dawn colors the morning sky in the Winterwarm area of Fallbrook. Photo courtesy of Scott Chester.